I have owned this Buck Vanguard knife for about 5 years. It follows me on all of my hunting trips and has never let me down. I am a big game hunter and have sacked big game from all over North America. I have bagged moose in Newfoudland and Alaska. Big Horn Sheep in Montana. Elk in Colorado and many whitetail and mule deer. I have used this knife for field dressing all of them. The Buck Vanguard is a very comfortable knife. It fits my hand well. The finger guard keeps the index finger where it belongs and provides leverage when cutting detailed areas. The blade is made from 420HC stainless steel. I am not sure of the hardness, but it seems to be about RC 58-60 when compared to the hardness of my other knives. The edge takes a very fine edge which is very nice for cutting through flesh. The hollow grind works very well for field dressing and camp utilities. The 420HC stays very sharp. The knife is fitted very well. The handle and the fittings have held up very well considering the amount of weather that this knife has seen. 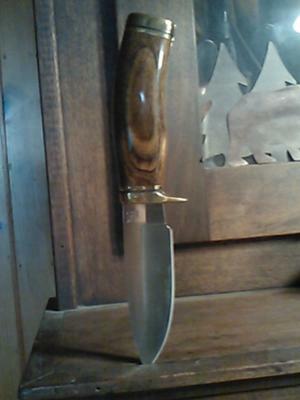 I am sure that I will be carrying and using this knife on my hunting trips for many years to come. Get your very own Buck Vanguard knife here. We have 2 models available. One model has the rosewood handle and the other model has a rubber handle to resist moisture and provide better grip. Both version are made from 420HC stainless steel. Features: Blade Detail: Plain Edge. Blade Length (inches): 4.13. Blade Material: 420HC. Carry System: Leather Sheath. Handle Material: Rubber. Overall Length (inches): 8.50. Special Features: N/A. Join in and write your own page! It's easy to do. How? Simply click here to return to Knife Steel Invitation.